Stiverne vs. Wilder: Bombs Away! In what could be the liveliest heavyweight scrap of recent times, reigning WBC champ Bermane Stiverne will face undefeated KO artist Deonte Wilder, on January 17th at the legendary MGM Grand, Las Vegas. This could be the fight to bring heavyweight glory back to its rightful home, and finally reignite the spark that has been absent from the big boys’ division for far too long. 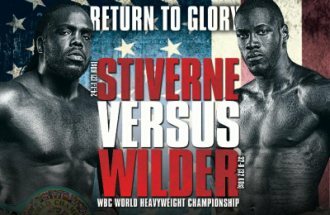 Will Wilder’s undeniable power be enough to overcome Stiverne’s solid chin and vicious countering abilities? Or will the young lion be ‘exposed’ following his widely considered ‘soft’ opposition? With a genuine ‘anything can happen’ element to this potential classic, there’s a lot to be excited about. Jim Lampley’s famous “theatre of the unexpected” tag will be more than appropriate here. Stiverne has proven himself a fierce adversary with a string of strong performances in recent years, icing his cake with a stoppage win over the usually iron-chinned Cris Arreola in their rematch in May of last year. Stiverne countered well in that fight against Arreola’s aggressive offense, and floored an in-shape Arreola with a wide right hook in the 6th. Despite beating the count, The Nightmare was on shaky legs, and went down again before being saved by the referee, shortly after beating a 2nd count. Stiverne pocketed the vacant WBC strap in the process, and aligned himself as the successor to Vitali Klitchko’s green-strap reign. Deonte Wilder has literally obliterated all-comers so far in his KO-happy career. Despite being accused of facing subpar opposition, he has still caught mounds of attention with his undeniable power. Although somewhat lacking in fundamental flair, this is really Wilder’s opportunity to finally prove himself to the doubters. Regardless of the level of opposition he has faced, he has still obliterated a few fairly solid-chinned men, and in doing so has shown his power is certainly not a myth. But power can be overcome with ring savvy and crafty IQ; something which Stiverne has proved he possesses. Wilder’s chin hasn’t been tested yet, but the Haitian slugger will surely be the man to do it. Even if his opposition isn’t leagues above Wilder’s, he has shown he can overcome adversity in the trenches and tag opponents in the heat of battle. Echoes of Seth Mitchell’s upset loss to Jonathan Banks a few years back show how easily a somewhat protected KO artist can come unstuck when stepping up their opposition. Whether they sink or swim is what makes these types of fights so exciting. However, a win for Wilder, KO or otherwise, would shake up the heavyweight division considerably. A KO win against the tough Haitian though, would surely strike fear into the boots of all the currently active big men. This should be a “blink and you’ll miss it” type of rumble, so be sure to grab your beer from the bar or fridge before the bell rings. You can bet the bombs will be thrown from the outset, and this one will be very unlikely to go the distance. 2015 may well start with a bang. You are here: Home / Top Stories Boxing / Stiverne vs. Wilder: Bombs Away!